"Can Pay Your Bills" ... Tele-Seminars, e-Courses, Books ... Huna and Ho`oponopono! 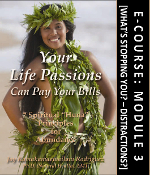 Module 1: Identify Your Life Passions Module 2: The Paradox Of Passion Module 3: What's Stopping You? Ho`oponopono (Forgiveness) and Huna (hidden or secret wisdom)is an Ancient Hawaiian Shamanic Tradition that can heal your Mind, Body, Soul, & Spirit, using these 7 Universal principles: `Ike; Kala; Maki; Manawa; Aloha; Mana; and Pono. So, browse through and shop for Products (e-Courses/Home Study; e-Books, as well as Paperbacks) with confidence. Create an account if you like, or shop as a guest. Either way, your Shopping Cart will be active until you leave the store. Mahalo Nui Loa (Thank you very much). Copyright © 2013-2019 Your Life Passions ... All rights reserved.